</pre>That seemed to have worked I thought, but when I was done I tried to browse to the new Bugzilla site and got an Internal Server Error message. 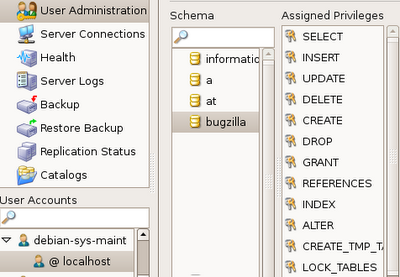 In order to fix the problem and get your Bugzilla up and running here’s what you need to do: access your mysql admin using both command line or MySQL Adminstrator app , Assign all privileges to the user debian-sys-maint @ localhost on the bugzilla Schema. Once you are done go back to your local to the bugzilla web page on your localhost, you should now be able to see the Bugzilla web interface. This solution and some explanations may be found on this thread.